2014 absolutely flew by. I guess people say that about each passing year, but this one felt especially quick. As an Olympic Hopeful, the closer the Rio 2016 Games approach, the faster the days seem to pass by. It’s unbelievable to think we are already looking at 2015 and with it, Olympic qualification in September at the 2015 World Rowing Championships. The past year was packed with a lot of change, lessons learned, a healthy mix of ups and downs, and most importantly, forward progress. Here is a short recap of some of the moments that stand out the most–whether they be good, bad, or a little ugly. My partner, Ellen Tomek and I were named to the 2014 United States National Team in the Women’s Double for the second consecutive year. This was her sixth team and only my second, but as a crew we have matured greatly in our two seasons together. We demonstrated our dominance as a crew at the 2014 USRowing National Selection Regatta (NSR #2), winning the regatta and thereby the bid to travel overseas and compete at the World Cups in hopes to qualify for the World Championships at the end of the summer. At World Cup II in Aiguebelette, we won a silver medal, just 1.4 seconds off of gold. It was our top finish and perhaps our best race as a crew yet. The second place finish in France automatically qualified us to be named to the 2014 National Team. For the second year in a row, we secured our bid to the World Championships by proving we were a medal-contending boat in one of the most competitive women’s events. 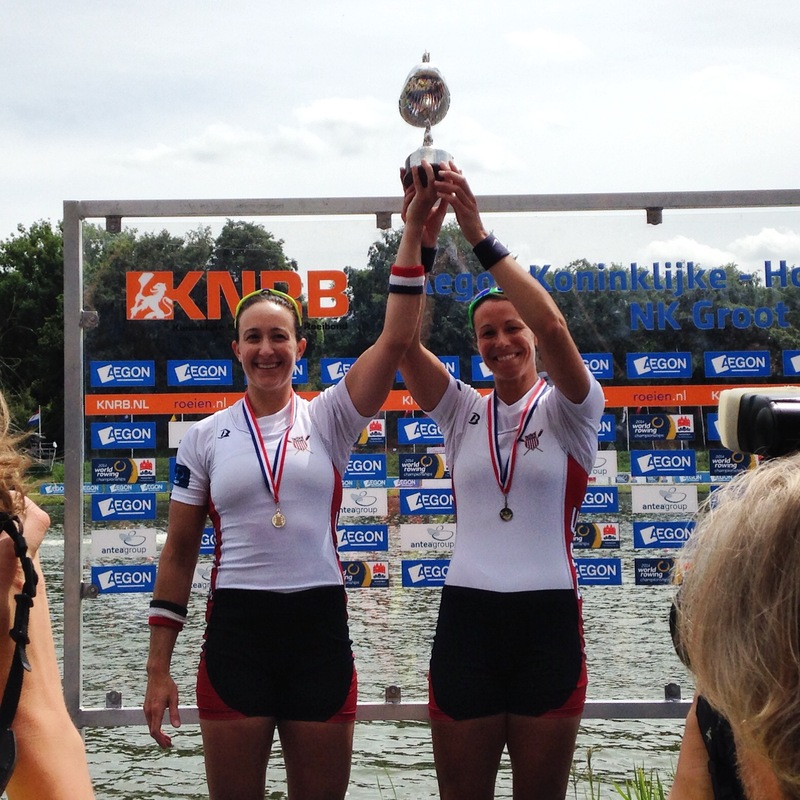 Following World Cup II we went on to compete at the Holland Beker Regatta in Amsterdam and came away with two gold medals in the women’s double. We ended a month of racing in Europe with World Rowing Cup III in Lucerne, Switzerland. Despite having a pretty rough regatta, we managed to finish just over three seconds out of first, in a tight fifth-place finish. While it may not have been an overall high point of the year, the positive takeaway from the regatta was that we could consistently be among the top crews even on our worst of days. Seeing the silver lining is powerful. Feeling discouraged by our World Cup III result, we returned to the States, hungrier than ever and hit the training hard, knowing we belonged on the podium. We bounced back stronger than ever and had a great month of training leading into the World Championships. When we left for Amsterdam in August, we felt fast, healthy, and race-ready from the lessons we learned from racing throughout the summer. Every up is often balanced by a down, and vice versa. It is the order of things–or at least how humans tend to justify the order of things. After such a successful World Cup II, we were confident about our prospects for the rest of the summer. Rowers meticulously and religiously prepare for years, putting in thousands of hours on the water and on the erg, eating and drinking the right things, getting enough sleep and doing absolutely everything in their power to stay healthy. So much training and preparation goes into such a short race. For all the things that must go exactly right to put you in a good position to compete and be successful, it takes just one thing to go wrong to kick your feet out from beneath you. Food poisoning, a cold from traveling halfway across the world, faulty equipment, one bad stroke, or a freak injury can drastically derail a rower’s path to success. 2014 World Championships. On the Bosbaan, Amsterdam. 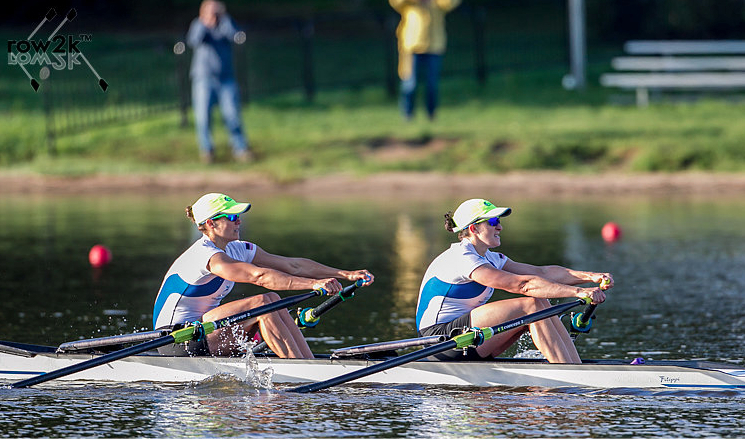 Unfortunately, the perfect storm hit us at the not-so-perfect timing of the World Rowing Championships in Amsterdam. As I already mentioned, we felt solid when we showed up in Amsterdam. We’d proven to ourselves that we could race with the best (and win) and we’d proven to others that we were a crew to keep an eye on. You see, the United States isn’t known for our sculling prowess. As a country, we have never won a gold medal at the World Championships or any medal at the Olympics in the women’s double. I love the fight of the underdog and felt that this was our chance to make history and change that statistic. Back to the perfect storm. From day one in Amsterdam, Ellen and I were riddled with issue after issue. It’s difficult enough adjusting to a new time zone and shaking off jetlag. You’d like to believe this will be your only hurdle to face. You’ve put so much time into preparing for everything else. We arrived to find that our racing boat looked like it was pulled through a Tough Mudder. There was a hole in the deck, deep scratches down the sides (beneath the water line), and the wrong riggers accompanying it. Deep breath, it’s all good. We’ve prepared for the worst, no problem. Grab the soap bucket and lets get some tape on this hole. Over the next week of practice, we struggled with the riggers–never quite getting the pitch right. We spent exhausting hours at the race course having checks and changes made to the boat, waiting, waiting some more, coming on and off the water multiple times in a day while our competition efficiently trained and went back to their hotels to rest. A few days before racing began, we even had a new set of riggers made and rush-delivered, only to have them arrive and find that they were manufactured incorrectly (with reverse differential welded into the aluminum…you rowing junkies will appreciate the ridiculousness of this). I thought the last straw would be witnessing the boatmaker’s employees literally bang the rigger against a tree to “bend it” back enough so that we could try and reverse the angle to create enough height. In the middle of all of this we went through two sets of oars, finding out that one was cracked and then the replacement pair was faulty as well. Oh yeah, and our boat wouldn’t run straight. Finally, after a few days of increasingly stronger pleading, the skeg was checked and found to be crooked. Must’ve banged a wall during that third obstacle of the Tough Mudder. Interesting data analysis comparing lanes (and subsequent finishing result) of the World Championships in 2013 vs. 2014. Separate from being caught in our own version of The Griswolds go the World Rowing Championships, the Bosbaan course in Amsterdam proved to be as difficult as it was rumored to be. Conditions were “challenging” and lanes were inconsistently unfair, advantaging crews and disadvantaging others. Unfortunately, we continuously found ourselves with the short end of the stick when it came to lane selection. It goes without saying that our World Rowing Championships experience was less than fantastic. Despite enduring a storm of obstacles, we fought our way into the A Final and raced with everything we had in a strongly disadvantaged lane one. We finished a disappointing sixth place. We were exhausted, a little beat down, but did our best to keep our heads up. Despite the bad, we had come a long way and accomplished a lot in just our second year. Sixth place is one better than the seventh place we finished in 2013. Another stepping stone. Momentum is on our side. I already mentioned our win at the National Selection Regatta. Anyone that raced that event or was there in attendance can attest to the horrid conditions experienced on day two of racing. The semifinal was one I will never forget. The stake-boat holders were gripping the sterns of the boats with white knuckles, a look of fear and strain in their eyes as a strong crosswind (20+ mph) and cold rain blew directly into us. The white caps had already swamped our boat during the warm-up. We barely could get the rate above a 30 in our practice starts. We literally started the race with our bow pointed nearly perpendicular to the course. The starting equipment wasn’t working (again), so the judge had to drop a flag and “yell” the starting command into a deafening wind. I’m pretty sure the crew next to us didn’t realize the race started until a few seconds after it was called. About 100 meters in, I caught an incredible boat-stopping crab (captured perfectly by row2k photographer, Erik Dresser). Looking back now, it was quite comical…but only because we went on to win in a blazing time of 7:58.45. I think we came down the course at a stroke rate of 27. Maybe. 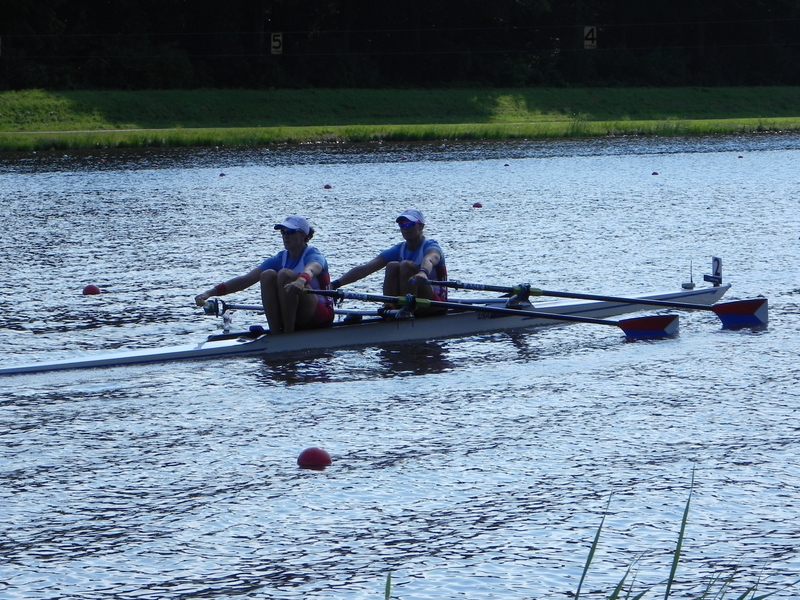 We had a bit of dejavu in Amsterdam during our repechage. Going into the rep as the top-seeded boat, we were strongly favored to win and approached the race relaxed and loose. Just put in the work; put in a solid race, but don’t expend too much because you’re going to need to bring it for the semifinal and hopefully, the A Final. Perhaps I was a little “too loose” with my hands. About 300 meters into the race, the sun was shining in such a way that it perfectly reflected off the water directly into your eyes, blinding you from being able to see the white rock-hard buoys that lined the lanes. We veered a bit into the buoys, and before we realized it, I hit one perfectly square on top, knocking my port oar completely out of my hands. Miraculously, I caught it on the way up the slide…but without my knowing, the blade had done a complete 180 and was backwards when I took the next two, three, five strokes. It wasn’t until Ellen looked behind me from stroke and yelled, “OTHER WAY!” that I made the adjustment, righting the blade face and getting back to work. By this point we were several lengths down but knew we had it in us to get it back. Over the next 1700 meters we worked our way through all of the crews, finishing over a length up to win the repechage. Our families and coaches in the stands were unaware of what had happened at the top of the course and commended us for racing conservatively, and just “doing what needed to be done” to win the race. You can imagine how their jaws dropped after hearing what actually led to our glorious finish. Somehow we still put up the fastest time across all of the other reps. Again, I can laugh at myself now, but my heart still skips a beat just thinking about how disastrous that one mistake could have been. Following a few weeks away from the boathouse in September, Ellen and I attacked our training with a renewed zeal this fall, determined to make sure we do everything we can to have an even better year in 2015. Train harder, train smarter, and leave nothing left to doubt. We still have a lot of work to do and continue to challenge ourselves each and every day to take those critical steps toward becoming a stronger, faster, and top crew. 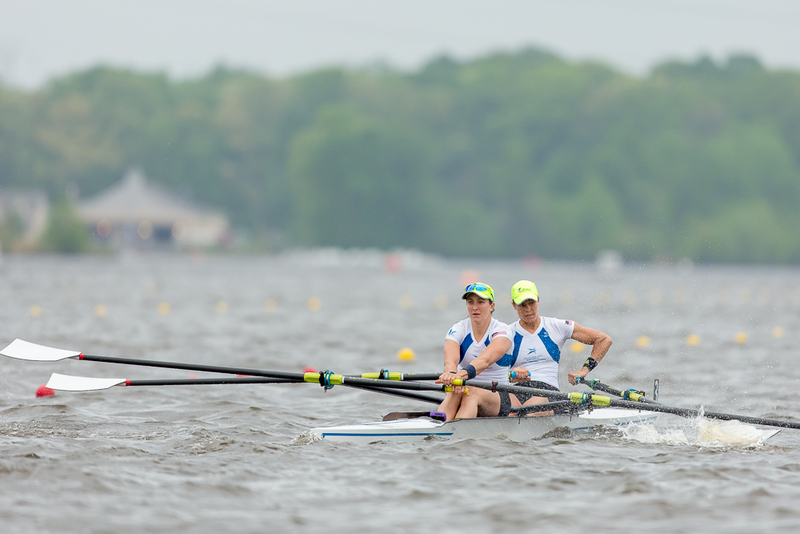 Racing starts in only a few short months with the USRowing National Selection Regatta #1 April 21-25, 2015. It’ll be here before we know it. Loved this write-up! Have a happy new year and best of luck in 2015! Fine recap of 2014, Meghan. The “bad” really was awful to read. A lesser competitor would have thrown in the towel with all the roadblocks and mishaps. Well it IS a new year and time to refocus. The best of luck to you and Ellen and Happy New Year!